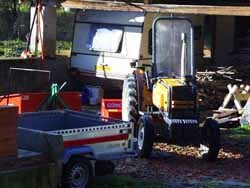 Hiding in our wood barn, behind a yard busy with tractor and machinery, the caravan is sheltered from weather and heat. It has now served the needs of > 50 guests and we hope that many more will come, though we now have other accomodation available in a converted barn. The caravan has lighting - and a heater for the colder months. The barn is a home in one room, with bed-settee, desk, table and kitchenette all combined; it served our own family needs for eight years while our house up the road was prepared. Lee and Karen have just ticked over 50, Rohan is now eight. 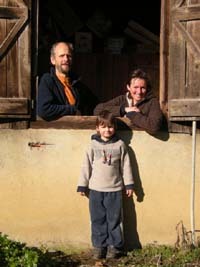 We first came to France from the UK in 2002, trekked the Pyrenees for two months, then settled into a years WWOOFing while searching for property. That was purchased finally at the end of 2003, and we moved in August 2004. In escaping to France, we quit office jobs and a terraced house in the city, so it has been quite a life change. The change of language alone is quite vexing! Did you know that 'plus' can mean 'more' OR 'none' in french? It all depends on pronunciation: pluss for more, or pluhh for none. French word endings are always tricky for english speakers; we've been taught to pronounce every letter, but with French one must learn to 'drop' letters. We're far from fluent in the French language, and while we may not be the best examples to learn the lingo from, we can translate and help you learn, because we are still learning. We're also delighted for french speaking visitors to come and help boost our own learning. Travelling by plane to Pau, Toulouse or Carcassonne, the train will complete your journey to St Gaudens train station. Alternatively, take the train right across Europe, or even the coach. St Gaudens is the usual pick-up point for visitors by train; there is no regular local bus service out to Izaut de l'Hotel. We are situated in the departement of Haut Garonne (dept 31), part of the Midi-Pyrenees region close to the Pyrenees in south-west France. If you're arriving by car or by bike: access travel information and maps on the frontpage of our commercial website. It is possible to go online in english with the SNCF. Look for the tiny round flagset near lower left of the home page. Young people (12-25) can get 25% reductions on certain trains (timings), in the limit of places available at that price; ie. limited places with reduction are available, so that to be sure of gaining the reduction, you are better to reserve in advance. Young people can also purchase a travel-pass card 'Decouverte 12-25' (49 Euros) which then entitles 50% reductions during one whole year. Again, any such discount is only available within the limits of places available, so advance booking is advisable to take advantage of this. People of all ages can qualify for a discount under the category 'Decouverte' for a return trip which stays away over a wkd. Again, only on certain train-timings, and limited places. Look for us in the directory of WWOOF France. Please quote your WWOOF membership number in any first inquiry.